Tue 30 August 2016 "Summer Discoveries – pt 1"
We made a couple of discoveries this summer of good places to visit, both on the recommendation of friends. 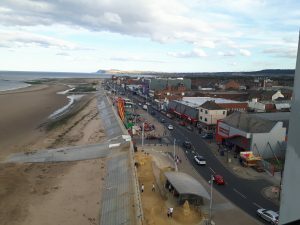 The first is Redcar beach, which was a great place to visit. At only just over an hour from Harrogate, it is probably the closest beach to us in terms of travel time, and it’s pretty much motorway or dual carriageway the whole way. The beach is enormous, especially at low tide, and – at least when we were there – largely empty. I did one of those fancy panaroma things on my phone, which gives the idea of just how spacious it is. Do click through and zoom in for the full spendour. Admittedly, this particular spot was probably 20 to 30 minutes walk along the beach from Redcar itself, and I’m not sure if there was anywhere closer to park. On the other hand, even when we were on the bit of beach much closer to the town there were only maybe 2 or 3 other groups anywhere near us. There is a stretch of beach with a lifeguard and designated swimming, which I guess may have been a bit busier, but as we were only paddling we opted to explore along the beach a bit. It also wasn’t the hottest of days, and a Friday, but it is such an enormous beach, it’s hard to imagine that 5 minutes walk wouldn’t get you somewhere secluded. 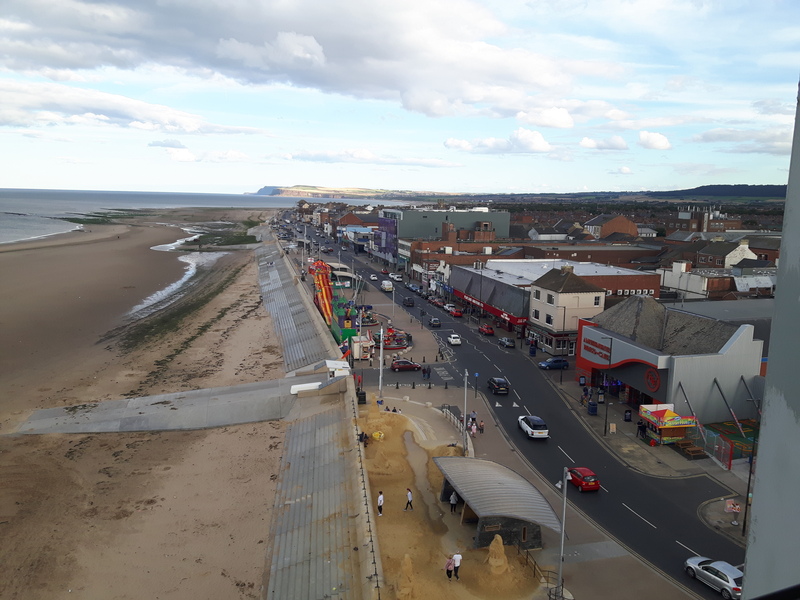 Also worth a look is the Redcar Beacon – a “vertical pier” on the seafront, that’s free entry to climb up, with a viewing platform on the top (and also the home to Zetland FM, it would seem, so if radio nerdery is your thing – and if it isn’t then it should be, let’s face it – you can while the hours away watching the presenting doing his or her thing through the glass-walled studio halfway up the tower). The council website, while a little obtuse, rewards careful investigation with lots of information about parking, tide times, etc. Long stay parking is three pounds for the day, and the carparks are all only a short walk from the beach. If we’re talking about beaches, then Sands End (near Whitby) and Robin Hood’s Bay also deserve honourable mentions as good places for a day out.